The Cumberland & Dumfriesshire Farmers Mart P.L.C. 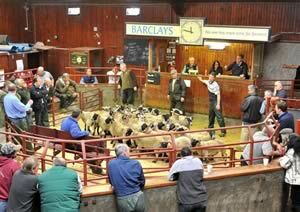 had forward 79 prime cattle, 17 over thirty month cattle, 1,858 prime lambs and 3,789 cast ewes & rams at their weekly sale at Longtown on Thursday 1st July, 2010. Clean cattle lacked overall quality. Top price of 182.5p for a Limousin heifer from Brydekirk Mains, others 175.5p Dashwellgreen, 174.5p Brisco Hill; Blonde d’Aquitaine 173.5p Dashwellgreen. Limousin bullocks to 172.5p, 171.5p Dashwellgreen. OTM cattle again met a flying trade with more feeding cows on offer. Top price of 117.5p for a Limousin cow from J.W. Vevers, High Stenries, others to 111.5p Mossband House, 105.5p High Stenries, 97.5p Cumcrook; Simmental 107.5p Cumcrook, 99.5p, 93.5p Sleetbeck, 93.5p Bonshawside; British Blue 105.5p Spoutbank, 103.5p Bonshawside; Angus 91.5p High Stenries; Hereford 87.5p High Strenries. Bullocks to 106.5p for Limousin from High Floweryhirst. A larger show of 1,858 prime lambs was forward. Although lambs proved harder to cash, as was the case all over this week. The sale still managed to average 160.7p per kilo, similar to two weeks ago. The sale was topped at 182p per kilo for Beltex from C. Jackson, Oakfield Drive and to £84 for Beltex’s from Messrs Gribbon, Waterside, others £83.80 Old Rectory; Texel £82.80 Bonshawside, £82.50 Peela Hill; Suffolk £82.50 Cumcrook, £81.80 Hallburn, £81.50 Wallend; Charollais £73.20 Old Rectory, £72.80, £71.80 The Yett; Hill Cheviot £69.50 Hall Farm; Badger Face £64.50 Sunnyside; Cheviot Mule £63.80 Allanshaws. The 170 light weight lambs sold to a top of £59.80 for Beltex from Mossband House; Texel £59 Dallowie, £58.80 Haggistone Holm; Suffolk £58.20 Dallowie. A similar show of 3,789 cast ewes and rams and old season hoggs were forward. A full ring of buyers saw trade similar on the week with all classes easily sold. The sale was topped at £138.50 for Texel rams from Coytre, £120.50 Oswie; Suffolk £126.50 Newbigging, £119.50 Coytre; Leicester £118.50 Howburn; Charollais £112.50 Tirril; Bleu d’Maine £100.50 Thornley; North Country Cheviot £87.50 Stackbraes; Lleyn £74.50 Tirril; Blackface £69.50 Newbigging, £66.50 Peela Hill; Swaledale £54.50 Howburn. Heavy ewes to £134.50 for Suffolks from Tirril, others £130.50 Middle Farm, £128.50 Winterhope; Texel £122.50 Roadside, £120.50 Bluebell, £114.50 Carran; Charollais £110.50 Bluebell, £108.50 Severs, £102.50 Bleu d’Maine £108.50, £92.50 Whinfield; North Country Cheviot £94.50 Brabsterdorran Mains, £92.50 Allanshaws, £90 Ballinliss; Leicester £90.50 Howburn, £82.50 Allanshaws; Roussin £84.50 Drumberg; Greyface £84.50 Newbigging, £80.50 Stackbraes, £78.50 Haggistone Holm; Dorset £77.50 Trecorner; Cheviot Mule £75.50 Mossburnford; Easycare £68.50 Derwent House, £65.50 Godscroft. Hill ewes to £78.50 for Lleyns from Stackbraes; Cheviot £74.50, £69.50 Mossband House, £67.50 Tarnside House; Blackface £72.50, £65.50 Eastlandsend, £64.50 Tirril; Swaledale £68.50 Roosecote, £56.50 Greenley Cleugh, £55.50 Brisco Hill; Jacob £62.50 Whinfield; Beulah £54.50 Derwent House; Herdwick £47.50 Mossband House, £46.50 Whinfield, £42.50 Haithwaite; Kendal Rough £45.50 Churchview; Shetland £43.50 Haithwaite.